The Japan Times October 10 - Kazuma Okamoto has spent all season showing why many think he could be one of Japan’s next great slugging stars. Now he’ll get to show it against some of MLB’s best. Okamoto, the Yomiuri Giants’ 22-year-old cleanup hitter, was given his first call-up to the Samurai Japan top team on Wednesday, when manager Atsunori Inaba revealed his roster for next month’s Japan All-Star Series, which will pit the national team against an MLB All-Star squad. “I’m looking forward to seeing how I stack up against the MLB pitchers,” Okamoto said in a statement released by Samurai Japan. The series will take place Nov. 8-15 at Tokyo Dome, Nagoya Dome and Hiroshima’s Mazda Stadium. It’s the latest step in Japan’s preparation for the baseball competition at the upcoming 2020 Tokyo Olympics. An NPB-high six members of the Pacific League champion Seibu Lions will be on the team. Slugger Hotaka Yamakawa, a leading PL MVP candidate, will be joined by infielders Sosuke Genda and Shuta Tonosaki, outfielder Shogo Akiyama, catcher Tomoya Mori and pitcher Shinsaburo Tawata. Yokohama BayStars rookie left-hander Katsuki Azuma, who finished second in the Central League with a 2.46 ERA, was among the first-timers on the squad. Japan’s two biggest pitching stars were left off the roster. Giants ace Tomoyuki Sugano declined an invitation, citing his condition, while the Lions’ Yusei Kikuchi, who many think could move to MLB via the posting system this winter, was not selected. Veteran Tohoku Rakuten Golden Eagles right-hander Takayuki Kishi, 33, is the most accomplished pitcher on the staff. The Hiroshima Carp’s Daichi Osera was chosen after a 15-win season this year and the Hokkaido Nippon Ham Fighters’ Naoyuki Uwasawa was also among those chosen. “I’m looking forward to the chance to compete against players who are playing at a high level in the majors,” Osera said. Inaba also selected closers Yasuaki Yamasaki, of the BayStars and the Eagles’ Yuki Matsui. The Fukuoka SoftBank Hawks’ Takuya Kai and the Carp’s Tsubasa Aizawa will join Mori in the catching ranks. 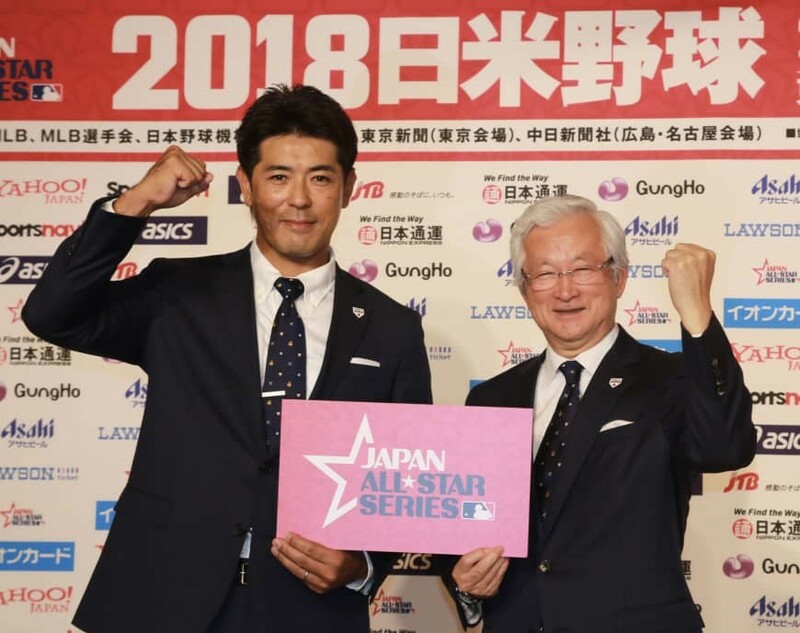 The infield selections were highlighted by Yamakawa and Okamoto and mainstays Tetsuto Yamada, of the Tokyo Yakult Swallows, and the Carp’s Ryosuke Kikuchi, two members of the team that reached the semifinals of the 2017 World Baseball Classic. The Hawks’ Yuki Yanagita and the BayStars’ Yoshitomo Tsutsugo, also members of the 2017 team, give Japan a pair of hard-hitting outfielders with 24-year-old Rakuten player Kazuki Tanaka also making the cut. Okamoto hit a pair of home runs in the Giants’ final game the season on Tuesday to help the Kyojin seal a berth in the postseason. Okamoto finished the year batting .309 with 33 homers and 100 RBIs, becoming the youngest player in NPB history to bat at least .300 with 30 homers and 100 RBIs. “He obviously showed great growth throughout this year hitting in the cleanup spot for the Giants and he came up with results, so I thought he had good mental strength as well,” Inaba said. “I believe it’s the first time for him to be on a Japan team, but we’d just like him to perform the way he has until now. Okamoto is being thought of as a possible No. 4 hitter for Japan by the time the Olympics roll around, as are Yamakawa and Tsutsugo, in two years. Inaba, though, is planning to take things slowly at the outset.